1. a dial gage for thickness applications, the type that reads from 0 to 100 as the spindle moves up into the case. A revolution counter is not necessary. 2. a flat contact point for the spindle. Check this carefully to ensure the contact surface is exactly square to the spindle. 3. a base, which you may be able to make. If not, buy a two-inch base of the type used with depth indicators. In either case, the bottom surface of the base requires that two grooves, as in figures 1 and 2, be filed or ground across it. The first is the width (3/8") of the hole for the stem and approximately 3/16" deep. 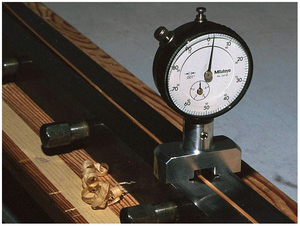 The second is the same width as the groove in your plane and .005" to .010" deep. With this wider groove the base presents the same footprint as your plane and compensates for many imperfections in your form. 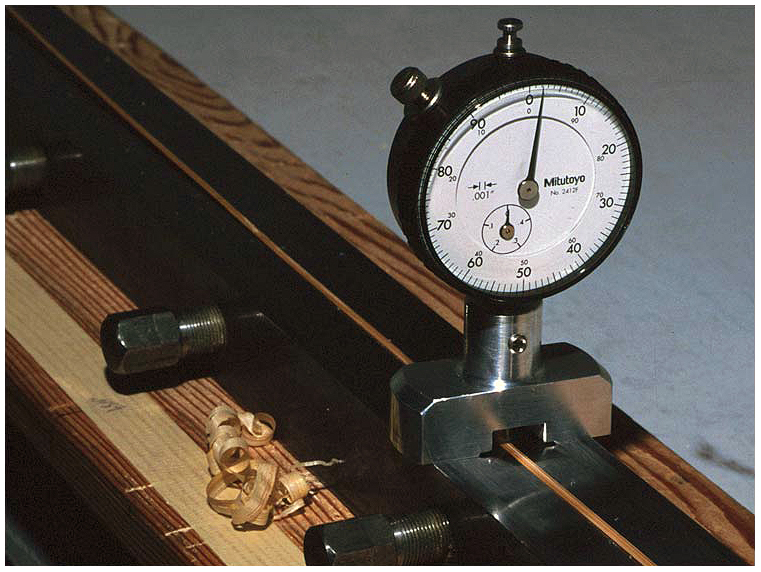 (1) See elsewhere on this website for instructions on "grooving" a plane. (2) Note, this plane is fitted with a plane leveler, also known as "training wheels".